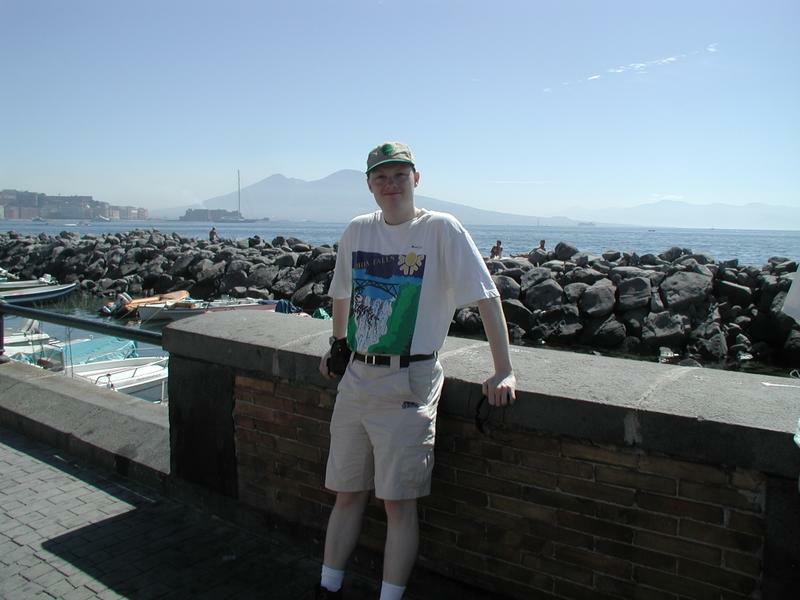 Adam J Purcell logs his travels to Rome and Pompeii in August 2004. Another month, another holiday! It's a hard life working for Staggering Stories - and this time no fewer than four Staggering Contributors (and two offspring of a couple of that number) made their way to Italy. It was a five day excursion starting at an unhealthily early 3:00AM on a Monday morning. Unable to get a flight from our doorstep Gatwick we instead had to make our way to the further flung (and rather smaller) Stanstead. The 2 hour EasyJet flight was particularly exciting for the kids (Andrew (16), Jamie (13) and Keith (39)) as it was their first time on a plane. Jamie, in particular, was grinning from ear to ear as we accelerated down the runway at take-off. Mr. Dalek had his first photo call in the departures lounge at Stanstead (actually it was his stunt double, Terry the Dalek, who made the trip with us - Mr. Dalek himself is afraid of flying, something to do with a bad incident involving a set of downward steps). A family of Americans looked greatly amused as this toy Dalek was put on a chair near them and a digital camera pointed in the general direction. I think they thought us all a bit strange. No doubt they were hoping we wouldn't share a flight with them. If we were on the same flight they did a good job of keeping away from us as I didn't see them again! The Italian with our party's name on a card was conspicuous by his absence so we ended up taking a taxi from the local airport based company instead. Karen, who had prebooked the missing taxi, muttered something darkly about a nasty email when she got back home. Unlike the 50 minute drive to Stanstead from Jean's London home this was a more comfortable 20 minute drive to our hotel - the grandly named Hotel American Palace. I'm not going to quibble about America being a republic and therefore not having any palaces but I do wonder what was American about the hotel. The staff spoke varying degrees of English but that is not uncommon in Rome. As we were leaving on the Friday I did meet a new guest, a rather oriental Texan, checking in. He was the only American I saw at the hotel. The glimpses of the other guests I did get suggested a mix of Brits, Germans and a few Italians. Basically then, from staff to guests, this was more of a European hotel. I suppose the word 'American' in a hotel name helps to sell it as English language friendly and, perhaps, tries to say something about the quality of amenities. In that regard it was a very serviceable hotel. I still prefer a place with a little fridge and a proper shower unit but this was a heck of a lot better than my lodgings in Rhodes. Given all of us but Jean had basically been wearing the same clothes for 36+ hours at this stage (we traveled up to her place on Sunday afternoon and got a few hours sleep without bothering to get undressed - at least in my case!) we decided to grab showers and a change of clothes before venturing forth into Rome. The two rooms (Karen, Keith and Jamie in one, Jean, Andrew and myself in the other) thankfully meant we had two bathrooms between the six of us and we were quickly leaving the hotel to find the nearest Metro station. After our 15-20 minute ride we jumped off at the Colosseo station, walked out into the ever bright, ever hot sun to be immediately confronted by the world famous Colosseum. Karen was virtually bouncing with joy at the sight of the ancient site. I'm not the most traveled person in the world (in fact I haven't really been outside Europe, United States excepted but that is so like home that it I don't even consider it truly 'foreign') so perhaps it isn't surprising that I'm still amazed, even after many countries under my belt, that one morning I'm in London and a few hours later I'm standing in front of something like the Colosseum. It just goes to show what a small world it is, especially with the advent of 'budget' airlines. There really is no excuse not to do at least two or three city breaks a year. There really are some amazing places only a short plane ride away (at least for us in Europe). 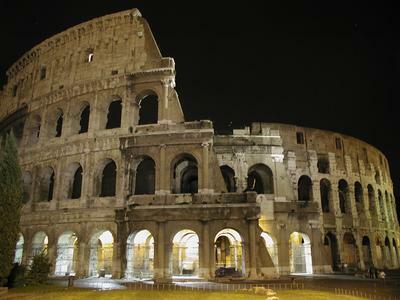 Last time I visited Rome I only really saw the Colosseum at night, I never had the chance to go inside. I was eager to finally have the chance of a guided tour when we stumbled across a woman peddling just such a thing (and, thankfully, in English too!) At 18 euros it wasn't cheap but none of us gave it a second thought - how could we come to Rome and not have a proper tour of the Colosseum? There was one oddity over the price, however. Andrew and Jamie were both classed as children for the tour, so they got in at a reduced rate. That's good and not all that unusual but what was unusual was the requirement that we have a passport or a driver's licence to show at the Colosseum ticket office. It didn't need to be their passports (and neither is yet old enough to drive in the UK). It didn't even have to share a surname with them. We'd all had to leave our passports with the hotel for a bit (which I was very reluctant to do - I hate handing over my passport to anyone, let alone leaving with strangers - it's too damned important for that) so none of us had a passport to hand. Only I had my UK driver's licence with me, so we used that. I'm not in anyway related to Andrew or Jamie so I have no idea what good it was - what exactly did that prove about their age?! Well, whatever, we got through the fast lane of the ticket office without question - if we'd have queued up with those not taking a tour we would have waited about 45 minutes in line. Even if the tour was no good it would still have been worth it just for that, especially in the scorching heat and given our natural fatigue from the early start and the journey. Impressive, most impressive. The Colosseum appears even larger inside than you'd expect from walking around the perimeter (all I could do 4 1/2 years ago) and it's surprisingly easy to imagine what it must have been like back in the days of gladiators and emperors. The guide explained how the solid but plain walls and ceilings would once have been plastered and painted to palatial standards. Elsewhere, especially on the floor, would have been the most remarkable slabs of marble. It would have put the most ornate of London's theatres to shame in its splendor. For over an hour we stood (and then most sat) in what little shade we could find on one of the terraces as the tour guide shared his wealth of knowledge and obvious passion on the subject. 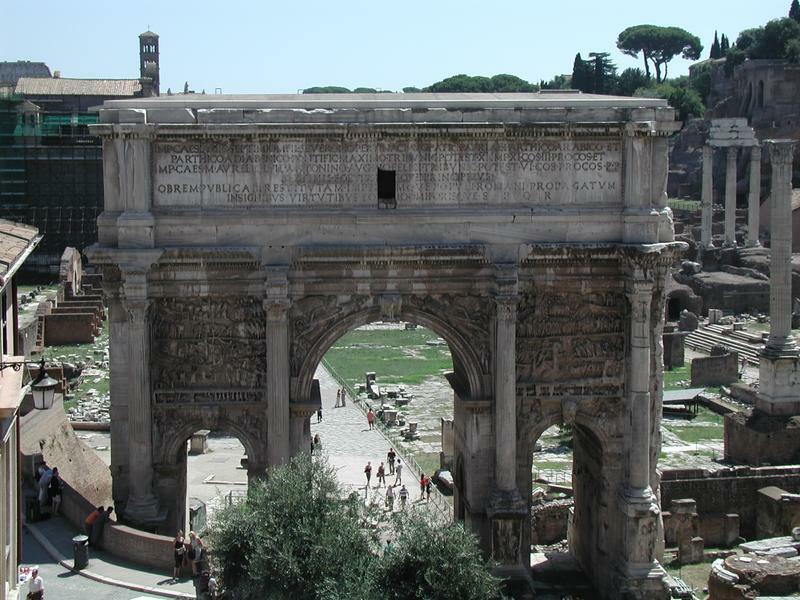 He explained how sailors were used to control great sails over the top of the Flavian Amphitheater (as it was originally known) to catch the wind and cool the people below. How the great oval center was a massive wooden stage covered with sand to soak up the plentiful blood, underneath a labyrinth of tunnels, small rooms and cages where combatants were held before contests began. Trap doors and slave driven lifts ejected ferocious animals into the middle of battles to delight the spectators. Brutal stuff that puts even the most violent films and computer games look very tame by comparison but I doubt there were many groups complaining back in those days, who'd dare to?! They may have been a blood thirsty lot but they certainly knew how to build things to last. When you find out that so much of the Colosseum has been looted (all of the marble, for example, is gone - most taken to build the Vatican), including about a third of the metal support claws that were dug from its walls, it is almost unbelievable that it still stands at all. A large section of the outer wall is gone, a tribute to on of at least four earth quakes the structure has otherwise survived, and besides the deliberate looting of materials it is in incredible condition. I very much doubt any modern building will still be with us in two thousand years. If you ever go to the Colosseum in your life (and you really should) be sure to get a guided tour, you'll really be missing out if you don't. It might, however, be best not to go during the midday at the height of summer, though, I think by the end of the hour long stationary talk only the tour guide and myself were still standing - everyone else had to sit down! They can't have gotten the full effect of the words if they weren't looking directly down into the centre of the amphitheater, imagining it as it would have been. No stamina, some people! Fatigue was clearly beginning to take its toll, particularly on the younger members of our party (I thought it was old people like myself who are supposed to tire easily?!) We made our way back to our hotel (though not before getting a few photos of Mr. Dalek at the Colosseum) to grab some dinner and an early night. The hotel restaurant was of reasonable price and quality, so much so that we actually ended up eating there again the next night. It was a fairly early night, much needed as it was, and a relatively early start the next day too (well, about an 08:00 wake up, I think). Breakfast was of the continental style I had encountered on my previous visit to Rome (a slightly less grand hotel than last time but you wouldn't have known it for the breakfast). My only complaint would be with the croissant - why, oh, why would anyone think it's a good idea to cover a croissant with a bit of icing? The sort of icing we have on 'sticky buns' back in the UK. I don't like it on those and it has even less place on an otherwise delicious croissant. That rant aside, there were plenty of sweet tasting bread rolls, ham (it's the new spam) and cheese to be getting on with. There were the other types of things you get at these breakfasts like the cereals, yoghurts, etc. but why would you want that instead of a nice ham roll?! Back home I don't normally eat breakfast (I know I should, best meal of the day and all but I just can't stomach it normally - plus it means I would have to wake up earlier) but on holiday I always try to. For one thing it is normally free (you should never turn down a free breakfast) and, more importantly, the way I holiday I need the energy to get me through to lunchtime. Tuesday was Vatican day. 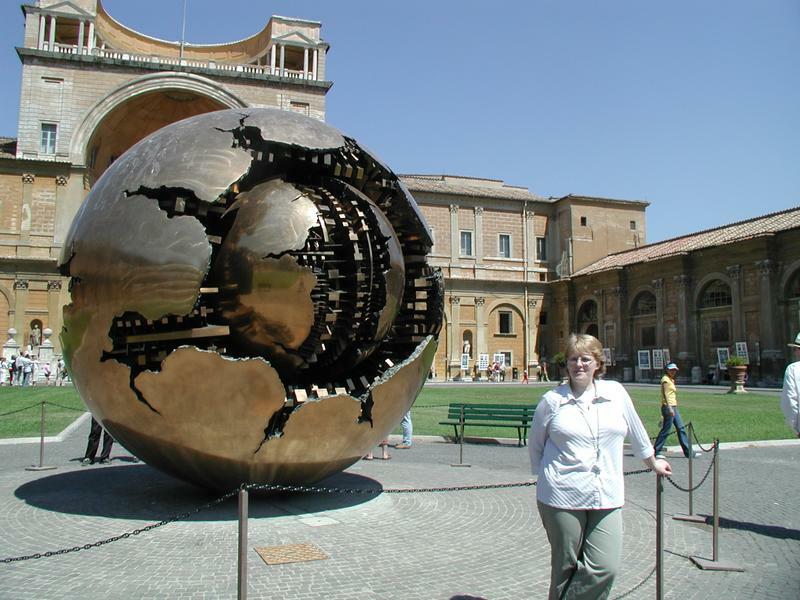 Last time I'd visited St. Peter's Square and Basilica. This time we didn't actually get to see inside the Basilica which is a shame as it really is an architectural marvel (apparently, until recently, the largest church in the world - I certainly remember it being absolutely immense). By the time we actually got to St. Peter's Square the others were too tired to take my hints and go inside. Before that, however, we spent the best part of the day wandering the many, and vast, museums. More painted ceilings than you can wave an army of paint brushes at and what felt like a never ending supply of statues the entire place must be worth more than the GDP of most small countries. Clearly these guys were incapable of saying 'haven't we got enough statues already?' or 'let's have a plain ceiling as a conversation piece.' No, I think there must have been constant competitions amongst the artists and authority figures to see who could produce the most art in their lifetimes. Perhaps they were hoping for some eternal prize - God's very own artist in the afterlife. I don't know but it does start to get a little repetitive after a while. Certainly you should see it, it's an incredible endeavour of multiple generations but beware that you can have too much of a good thing! 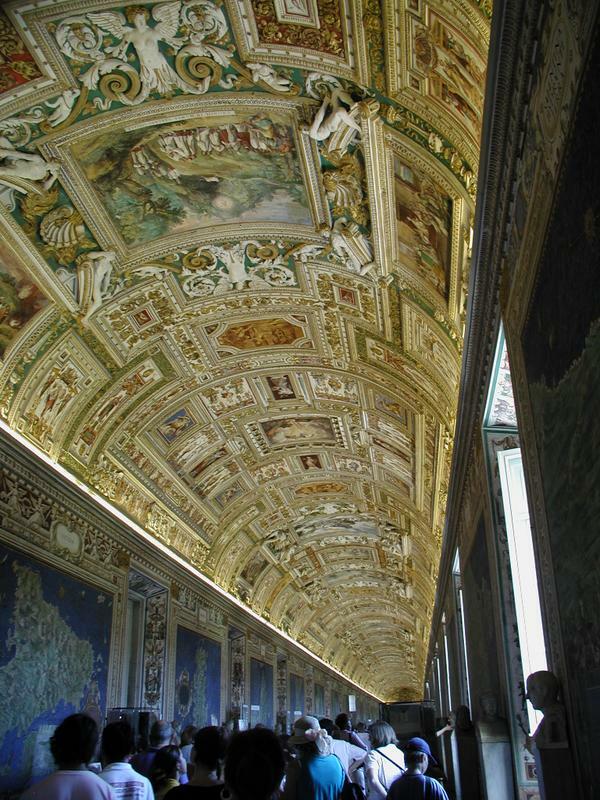 In fact by the time we ended up at the famous Sistine Chapel I was so fresco overloaded that I felt somewhat underwhelmed. It was unbelievably crowded and the rather over zealous security were more than keen to keep people moving and pounced on anyone pointing a camera (even non-flash photography was banned for, presumably, commercial reasons). Andrew and Jamie almost immediately went for the exit and I was eager to follow them to be out of the throng. Keith quickly followed while Jean and Karen stayed in there longer to admire what they could see of the famous painting on the much higher than I expected ceiling. Jean even managed to sneak a few photos. Early starts are always a little unpleasant but fortunately in this case we had a very good reward awaiting our sleep deprivation. First, however, we had to grab our breakfast packs (we left the hotel at about 06:30, before breakfast was served but Jean had the foresight to arrange some take away breakfast) and then rush to the nearby Metro station. There we waited. And waited. We'd estimated that trains came about every 15 minutes. We must have just missed one. We sat on the all but deserted platform eating our icing covered croissant, our dutch toast and drinking our tiny carton of peach juice willing the train to hurry up. We had only a limited amount of time before the coach would go without us and all we knew was that the coach company had an office a short walk away from Termini. As I nervously looked at my watch the train finally pulled in. Time was now officially tight. We jumped off at Termini, found the road we should go down to locate the square where the coach company was located and rushed off. It seemed further than I expected, especially as the clock counted down. Would we reach the last clue in time?! Where was it? We couldn't seem to find it. Map in hand one of our number rushed over to a policeman to attempt to ask for directions. We were sure it must be around here somewhere. We only had a couple of minutes to go! The answer came back - we were standing in the square in question. Where was the coach? The other travelers? Had they gone without us? Then, thankfully, we spotted a likely looking crowd and coach - in a square on the opposite side of the road. Throwing caution to the wind we rushed across the less than safe road and melted into the crowd. We were here all along - honest! Fortunately our coach was running a couple of minutes late. The coach we had seen was for another tour. Ours quickly arrived, already almost full from prior pick ups at other tour operator hotels (we booked our flights and hotel independently on the Internet). 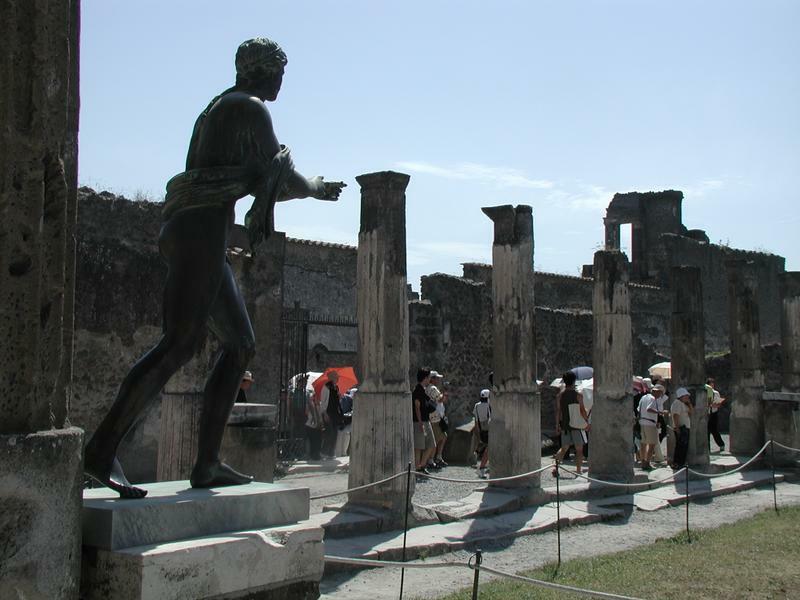 We were off to Pompeii! We can relax at last. I was expecting a journey of about an hour. It ended up being twice that, obviously I had miscalculated the distance. I really should have checked on my GPS rather than on a touristy fold-up paper map. We had a chatty Italian woman as our tour guide. Her English was good though her accent and the PA system meant I actually only understood about half of what she said. I must admit I quickly tuned her out - I just didn't have the energy to concentrate enough to understand her. She also had this very irritating vocal tick where she would make a tutting sound and say 'erm' a lot. It was a shame as it sounded like she had a lot of knowledge to impart. 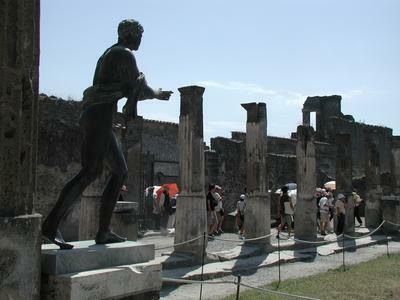 Still, it was Pompeii I really wanted to know about and that was a good drive away yet. Almost exactly halfway through our journey we stopped at a tiny little motorway service station. We weren't the first coach to arrive there, in fact there were a good 3 or 4 already there. The place was jammed packed. We had twenty minutes to buy refreshments and use the facilities. The queue for the mens was virtually non-existent but the same could not be said of the ladies. Jean and Karen queued for almost the entire 20 minutes. There was no time left to do anything else by the time they had returned. By that time the place had also emptied, I think we must have been the only coach left. Oh, well, back into the coach for the final leg. We didn't actually go directly to Pompeii. 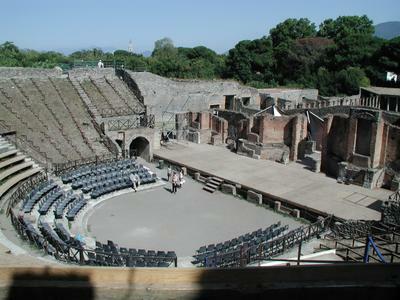 If I had been listening to the tour guide I would have known we were first stopping off in the nearby Napels. Stopping right next to the sea, we all jumped out with cameras at the ready to take snaps of Mount Vesuvius across the deep blue bay. Behind us 5 and 6 storey earthy coloured buildings receded up the hills and before us row upon row of small little boats bobbed behind an artificial wall of large jagged looking rocks. Unbelievably the more accessible of these uncomfortable looking rocks had various local looking people lying upon them. There was no beach here, only these rocks to absorb the power of the waves (not that there really were any at the time) and then the water lapped up directly against the walls by the coastal road. Jean even managed to find the tiniest stretch of sand. It was had a large crowd of very familiar looking beach huts, most having a view of little more than the closely surrounding beach huts, though. Another 20 minutes or so and it was back on the coach for what really was the final leg - around the bay to the foot of Mount Vesuvius and Pompeii. Finally, the time was upon us. The coach party all gathered around a new, Pompeii expert, tour guide who was going to show us around the vast ruins. About 2/3rds of the ancient town have been uncovered and it's in incredible condition. A lot of the walls have been knocked down to waist height or lower and few of the original roofs still exist but nonetheless the roads, pavements and shape of every building (even every groundfloor room) still exist to this day. We walked down what must have been their equivalent of our High Street, obviously the smallish buildings either side were shops. You could see where 7 decades of horse driven carts had started to wear away the cobbles of the roads before the pyroclastic flow covered them for nearly 2 millennia. You can jump across the large pavement stepping stones that allow you to cross to the other side of the road at important junctions (and save getting your feet wet when the major rains turn the roads into mini rivers. They even had one way streets. It was all incredibly well organised and not all that dissimilar to modern roads. Clearly the town had been planned, this was the adhoc organic development you get in most modern towns (who try desperately to retrospectively bring some order to the chaos). We only had about 4 hours to explore the town and it wasn't nearly enough. Apparently there are many very well preserved frescoes in a section of the town we didn't get to (including several rather sexually explicit ones in what was the town brothel!) Ditching the tour guide early on we started off with the remains of two major temples: Venus and Apollo. Mr. Dalek made a couple of appearances (again carried by his faithful assistant, Keith) before some rather famous statues. 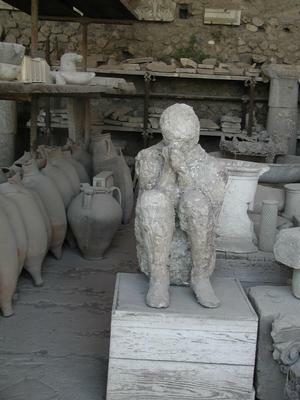 Then it was on to see the rather macabre remains of some victims of Vesuvius. In a way I found it hard to believe they were once alive, they were more like grotesque statues of people (and a dog) in their death throes. They were either asphyxiated by the carbon dioxide or they were scorched to death by the white hot ash raining down on them. Either way if clearly wasn't a pleasant way to go. Whatever their dying thoughts I'm sure it didn't include the idea that nearly two thousand years later tourists would be taking photos of their petrified remains. Back onto the coach, after a minor panic as to where we would find it, and then a reverse of our previous trip - again stopping at the same mid-point (this time thankfully much less busy) and then dropped back off at the coach company front door. Hungry and wanting to get to bed we all, reluctantly in some cases, agreed to Andrew and Jamie's demand for a quick dinner at a MacDonald's we'd earlier seen next to Termini. MacDonald's is MacDonald's anywhere (though I was even less impressed with their fries than usual). It was quick and it was cheap. Two things in its favour. I was still somewhat disappointed that we still hadn't had a proper meal out yet - 2 nights at the hotel restaurant and then a MacDonalds... Oh, well, tomorrow we will have a proper meal! 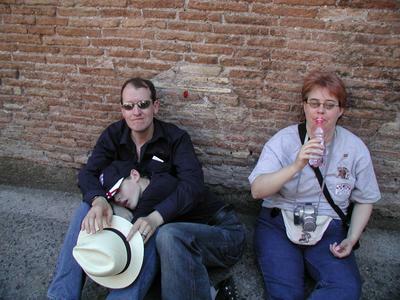 Andrew and Jamie wanted a lay in the following morning, the Thursday, our 4th and penultimate day in Italy. I could certainly understand that, we had been going at breakneck speed for three and a half days by that point. I, however, don't go on holiday to relax. I can relax just fine back at home, even at work (by comparison, at least). When I go on holiday I like to explore and make the most of the limited time I have available at the new place (or even old place as was the case with Rome this time). The four 'grown ups', Karen, Jean, Keith and myself (wow, am I really grown up?! When did that happen?) left the kids (not that Andrew, 16, would like to be called that) back at the hotel while we went in search of the Pantheon, the Trevi fountain, anything else I could remember being worth seeing in the area (that we could find) and whatever else we stumbled across. 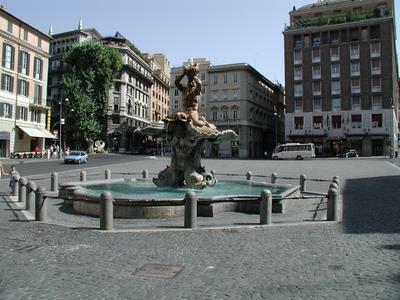 We jumped off the Metro at the Barbarini station and ascended out into Piazza Barbarini (Barbarini Square). The edges of the square appeared to function a bit like a roundabout and we had to rush across the road before us to get to the large ornamental fountain of Triton in the middle. For a city that is a good many miles from the sea these people certainly like their oceanic iconography. There are also more than a little fond of grand fountains at what seems like every major city intersection (of which there are many). That being the case we stopped long enough to take the obligatory tourist shots with our digital cameras and were on our way. Again the map was a little inadequate and Jean ended up approaching another Policeman for directions. Unfortunately he was having what appeared to be a non-duty-related mobile phone conversation. We waited. We waited some more. Then we gave up and asked someone else, a street cleaner I think. Armed with a new sense of direction we forged our way to the famous Pantheon. There is was, about as I remembered it (except a little more crowded but then I did go in January last time). It is tall but you don't really realise just how tall it is until you go inside and gaze up at the domed ceiling far above. While we were there the group thought that this was once home to the Roman Senate and the steps outside were where Julius Caesar was assassinated. The latter certainly isn't true and I find no reference to the former being the case either. 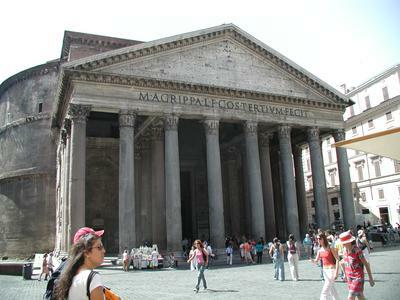 In actual fact the Pantheon was exactly as the named suggests - a temple for all the Roman gods. In recent years (actually from about the 7th Century CE, if you can call that 'recent') the Pantheon was converted into a Christian church and it still serves that purpose today. While we were there a massive set of scaffolding had been erected so the ceiling of the round building could be cleaned, section by section. It was certainly an eyesore but it did help give a real sense of scale, highlighting just how far up the centre of the dome really was. In the Pantheon you will also see some tombs around the perimeter, probably the most famous inhabitant being Raphael (the Renaissance painter, not the mutant ninja turtle). Given how immensely crowded it was I was glad to leave for an overlooking cafe. A funny thing happened on the way from the Pantheon (or was it going to it, I can't remember!) An Italian tourist was filling up a couple of 1 litre water bottles from a public drinking water fountain (of which Rome has many, thankfully!) As she was filling the last of them, with the already filled one sitting on the pavement beside her, another Italian walked up, kicked the full bottle a few metres, walked over, picked it up and proceeded to empty the contents over his head. The poor woman was complaining but the man paid her no heed. He then walked away and dumped the empty bottle in a nearby bin. Very strange behaviour. 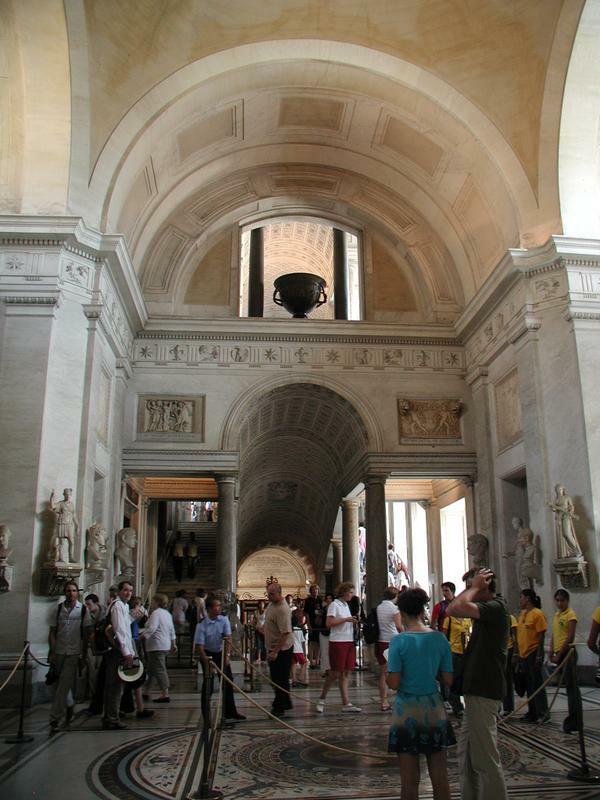 At first I thought him to be a yob of some kind but he walked back toward the Pantheon and disappeared into the crowd without causes any further trouble. Was he a stall owner who wanted to sell water? Was he an over zealous street cleaner? Was he just an irritating git? I doubt we'll ever know. If he'd just wanted to pour a bit of water over his head he could have just used the drinking fountain - there was plenty of room under the stream of water to get your head under it (the stream came from near the top of a tallish bollard like object and poured down into a grill in the ground). We were sure to keep our small water bottles in our hands after that little incident! True Italian chocolate icecream awaited us at the cafe. 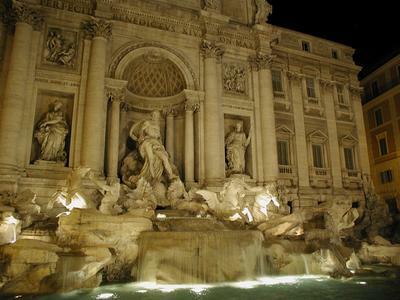 We didn't have too long before Karen had to return to the hotel to pick up Andrew and Jamie so we sat there for a bit watching the tourists flood by and soaking in another ornamental fountain (with fish spurting water from their mouths) and the Pantheon across the square. Just before we were about to leave I remembered there was a GeoCache somewhere around the Pantheon. I turned on my Zaurus (an advanced PDA like pocket computing device) to bring up the details and pulled out my GPS receiver. Sure enough there was a hidden cache about 70-80 feet away. I followed where my GPS directed me and came to the left hand side of the Pantheon. I searched for a couple of minutes (trying not to look too suspicious!) but couldn't locate it. Other people, including the person who originally hid the cache there, also had the same problem - obviously some inconsiderate person must have stolen it. A shame as that was the only cache I got near enough to actually look for. Someday I will manage to find a foreign geocache, though I may have to do a solo expedition as it's such a pain trying to get anyone else interested in going on a hunt. That's two holidays I've intended and yet failed to find a geocache... Oh, well, it's an excuse to return here someday. After that I managed to locate the others and we headed back to Barbarini to see Karen off on the Metro to pick up the kids. The remaining three of us wandered the area for an hour or so before returning to them again. 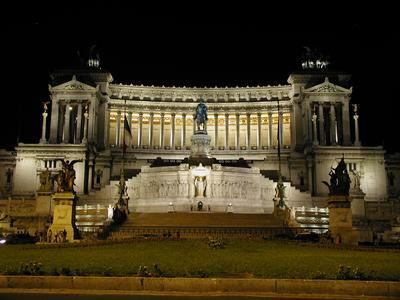 In that time the most notable thing we saw, though we didn't initially realise what it was, was the official residence of the Italian Prime Minister (currently, of course, the infamous Silvio Berlusconi). A single ceremonial guard at attention behind the great archway and a couple of normal policeman loitering around outside were the only overt security. Little wonder we didn't realise what it was - Number 10 Downing Street, where our Prime Minister resides, has far more obvious and beefier looking security (including Downing Street itself being blocked by a sturdy security fence). Jean approached the wary looking security to ask if she could take a photo of the ceremonial guard framed by the impressive archway (which could easily be walked through due to a lack of a gate... Keith and I kept well back, just in case, as she took her shot. The guard stayed at attention, troops didn't swarm out and start shooting at us, so with not inconsiderable relief we quickly rushed off without further ado - just in case! With all six of us reunited we made our way to the famous Trevi Fountain. I was glad to see that 'What's New Scooby Doo' wasn't telling the truth when they featured a large plain hotel being built across from the Trevi. No, it was exactly as it was before. The only difference was, again, the sheer number of pesky tourists! They were swarming everywhere around the fountain, so much so that you almost had to fight to get close enough to take photos (and, yes, Mr. Dalek made another furtive appearance.) It's certainly true that it is an impressive sight, the entire side of a building becomes the fountain with it's numerous figures (including winged horses!) leaping from the numerous cascades of water. 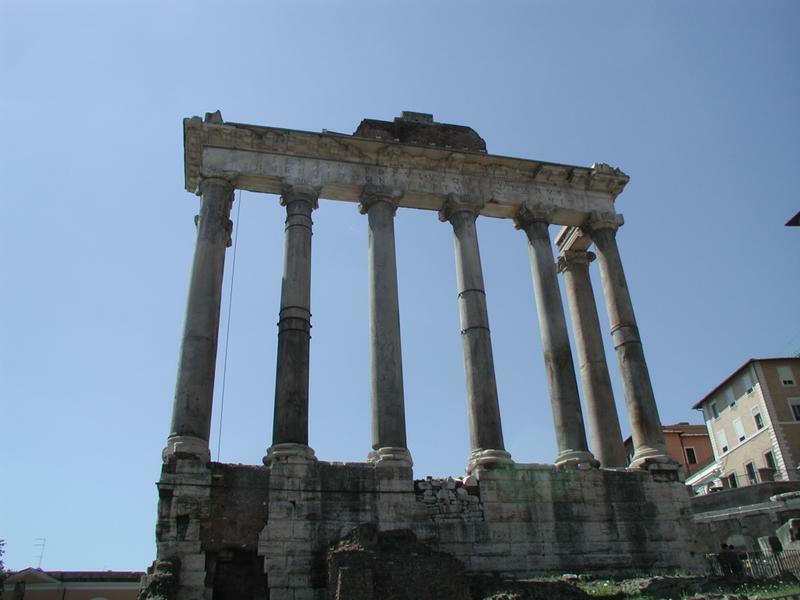 As is tradition we all threw in a coin - doing so will ensure you return to Rome one day. I can't remember if I did that last time or not but if I did I think I owe more to Karen for this trip than that coin! I wonder who gets to keep them when it has the inevitable routine clean out? I'm not superstitious but it's certainly good luck for them! We tried to go to the nearest catacombs, these were in the centre of Rome rather than on the edge as the others appeared to be. We got there and it was closed... Open Tuesdays and Wednesdays, I think. That is probably my greatest regret on my two visits to Rome, both times I have tried and failed to visit the catacombs. The first time we were told by the hotel staff that they were only a short distance away (I was further out of the city that time and had to get a bus and then the Metro to get into the centre). We went out for a walk along the then much less safe feeling roads (apparently many locals leave the city over August because it is both too hot and too full of tourists). We walked and walked, somewhat unsure where we were heading and eventually gave up and had to return (these roads didn't have pavements, either, so none of us felt too safe). I'd promised myself that on this latest trip I'd make up for my earlier disappointment. These catacombs sounded particularly interesting as the monks had apparently made artistic constructs from their dead colleagues. Thinking what else we could do it was decided, after seeing a tour bus go by, that we should try to get a guided tour of the city and fill in any blanks we may have missed. We surmised that Termini would be the most likely place we could pick up such a bus (Termini also being a major bus connecting point as well as a train and metro station). We did our best to ignore certain members of our party's call to stop off in the nearby MacDonalds or Burger King and instead managed to locate the tour bus pickup point. That wasn't before we spent nearly 15 minutes trying to find the toilets in the main Termini building, however - down into the sublevel and about half a mile trek to the other end of the building! Anyway, we boarded the open top bus after buying our tickets (about 12 euros) and plugged the stereo headsets we had been handed on our way aboard. It was a strange bus, basically it was a normal bus route and they picked up normal passengers along the way. The recorded commentary was piped through the headsets for those of us who had paid for the tour (most, if not all of us, upstairs) while everyone else just jumped on and off at the normal stops we passed. It was good and certainly gave us a view of the sights above the throng of tourists on the streets below. I'm not sure it was worth as much as 12 euros, especially considering the trip we were to take the next day, but it was nonetheless a nice relaxing alternative view of the city. Our first, and last, night for a proper meal out. 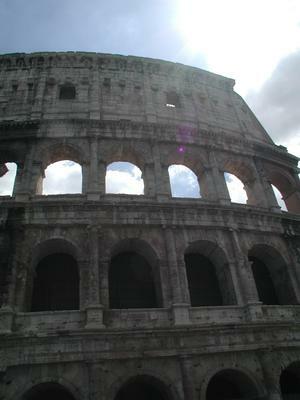 We walked back to the Colosseum, as the sun set, in the hope of finding a nearby restaurant. 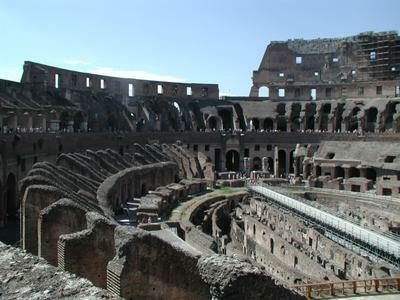 We did locate one with a large covered open air area, though it was too far away to actually see the Colosseum itself, sadly. Pizza was, again, the most popular choice but I, naturally, had steak. This was the only time we had any real communication problems when the waiter somehow thought we'd ordered another round of Pizza rather than a couple of beers. They rectified the error without any trouble. After our otherwise excellent meal we walked back to see the Colosseum in the dark. It wasn't fully flood lit but the light that was thrown upon it did a great job of making the building look even more impressive than it did during the day. We spent a good while there taking in the view and trying to get good, blur-free, photos of the incredible sight. I said it then (actually before then to persuade people) and I'll say it again now: you haven't seen Rome until you've seen it at night. Actually, I find that is true of most cities. We walked back past several other sights we'd already seen in daylight to get the night scenes and made our way back to the hotel to rest for our final day. Hotel American Palace was good enough to store our luggage for us after we checked out and ordered us a taxi for the airport (I think it was 16:30, or was it 17:00?) Anyway, once we'd all showered and packed (not that I had much to pack, I've learned to live out of my suitcase rather than ever fully unpack) we all jumped back on the Metro for the centre of the city again. Still disappointed by my failure to see the catacombs again I'd toyed with the idea of making my own way to some different ones. By the time we'd checked out, however, it was already nearly 10:30 and they close at midday. I didn't really have time. Grumpier than I should have been thanks to the general exhaustion that we were all suffering I instead decided to tag along with the others who were apparently planning a whole day of shopping... Already I was getting tired of our tendency to stop at every touristy stall or shop wherever we went I was not looking forward to five hours of it. Then I made a bet with myself (not telling anyone else) that there is no chance they would be able to keep it up beyond 12:00 midday - Andrew and Jamie would get terminally bored of it. I won my bet, I don't think we made it much past 11:00, but it wasn't forced by the kids (or myself!) - I think everyone found they didn't want to do much more shopping. Besides the Dunn's were already wondering if they'd have to use their credit card for things as they got low on euros. With sanity prevailing we made our way back to the Colosseum where Karen and Andrew had decided to spend a few hours while the other four of us go for a wander. 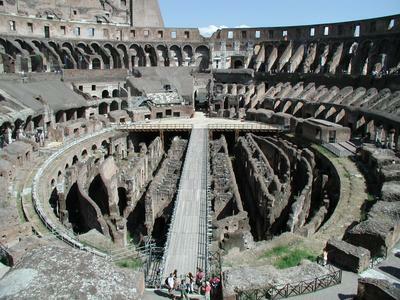 Mainly we walked amongst the ruins that stretch across quite a large section of the city near the Colosseum. I'd seen them from the road by hadn't realised you could actually go into them. By the end of it I found myself with the beginnings of a head ache so I was sure to drink water as much as I could and kept to the shade. As I've suggested before the midday August sun in Rome is less than forgiving. Returning to find Karen and Andrew standing in the shade of a restaurant overlooking the Colosseum (a restaurant we'd originally wanted to try the night before by it was closed) we decided it was a good time for lunch. Obtaining a table for six we had a good meal, more like dinner than lunch in its proportions, as we kept an eye on the Colosseum - yes it was still there throughout! I remember I had a particularly tasty piece of chicken and chips (could almost have been back home!) Jamie inadvertently caused a bit of entertainment when a cheap flour filled rubber 'face' (that you could pinch and prod to give it features), that Karen and Andrew had bought for Jamie as they waited for us to return, exploded at the table. Fortunately Jamie was on the end and most of the flour (or whatever the white powder was) went onto the floor. A lot hit Jamie and some myself, though. I was wearing black trousers in anticipation of the flight home later that afternoon (rather than the normal beige shorts I was wearing the rest of the week (yes, I had more than one pair with me!)) and the flour looked particularly bad on those. Fortunately the traces I couldn't remove before the airport didn't cause customs to stop me on the way into the UK! With only about an hour before we needed to return to the hotel to pick up our luggage and take our taxi we pondered what we should do. The previous day outside the Pantheon Karen had inquired how much a horse drawn carriage ride would be. The first answer was about 160 euros! We declined, that was more than we wanted to pay by far. The chap kept lowering his price and suggesting a shorter trip but in the end we decided not to go for it at the time. Outside the Colosseum a similar group of carriages awaited. We all checked how much cash we had left - we'd already paid the hotel the fixed taxi fee - and decided that we had nothing better to spend it on. I think it worked out at about 20 euros each. Still not cheap but we'd only have to get any remaining euros changed back into pounds on our return anyway (which, in the end I did to the tune of about £50 - not much of a safety net..!) Really the carriage was designed for four people so it was quite a squeeze. Keith went up the front with the driver and attempted to translate (despite knowing basically no Italian and the driver's English was pretty ropey!) The rest of us crammed into the back of the open top carriage. It was, er, very cosy! Andrew had his knees either side of Jean's, Karen and I had ours sandwiched together and Jamie was squashed between Jean and Karen. It did feel a little precarious but was, nonetheless, fun. Despite the language barriers we learnt more than we did on the bus tour and it was certainly interesting riding alone with the normal traffic all around us! We saw the remains of the Theatrum Pompeium where Julius Caesar really was killed and, being in something not unlike a chariot, got a real idea of just how big the chariot track was as we rode down past one side of it. 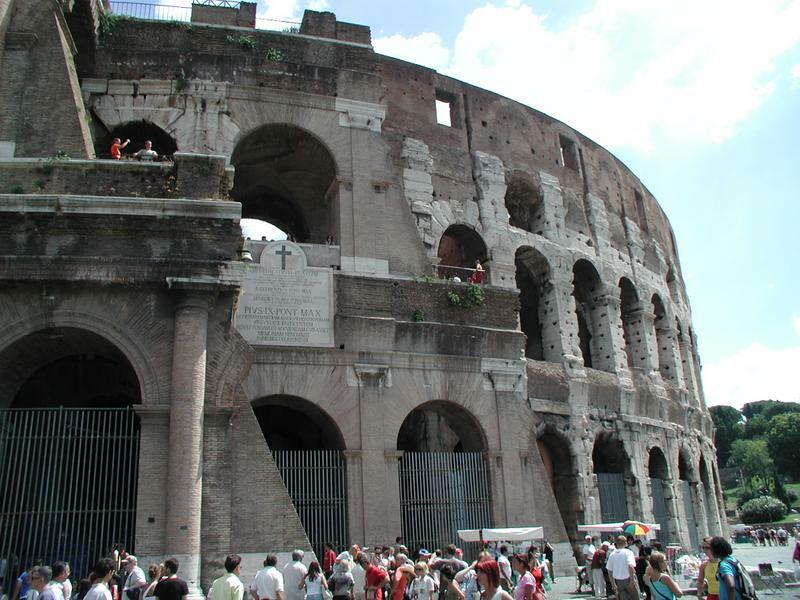 As we pulled back into the Colosseum we bade a final farewell (for this trip, anyway) to the massive amphitheater as we returned to the Colosseo Metro station to begin our trip back home. No longer having any rooms we waited for the taxi by the hotel bar as a coach load of tourists turned up to check in. I wonder it any of them got our rooms? It was here, as we queued up for the loo, that we met the American tourist (who Jamie queue jumped not realising he was waiting!) With our bags back our taxi arrived and we said goodbye to the hotel that we'd had too many meals at! The short journey included us driving past some catacombs (only about 7 minutes drive from the hotel). If I didn't know better I might suspect one of the others had asked the driving to take that route especially! It was a long wait at the airport. For the first time on the trip we'd seen some British newspapers and Karen and Jean both bought one (perhaps stretching the definition of newspaper in one case..!) We sat their waiting for a couple of hours, reading and generally siting there exhausted. The plane was about 20 minutes or so late. Even more by the time we'd actually taken off. We took off at what must have been about 21:00, local time. Night flights are good for the views and we all took good looks out of the window at the lights of the cities and towns below (this wasn't my first night flight by a long stretch but it's still fun to look at the little lights and work out what they are). I'm not going to complain about the in-cabin service. Let's just say it could have been much better. That's the price you pay for going on a budget airline, needless to say I didn't have any problems with British Airways on my last flight to and from Rome. If you're reading EasyJet - make sure you don't run out of Pringles or, if you do, make sure you at least serve people who are together together! Anyway... We played a bit of rummy and read our books and before we knew it we were touching down in Stanstead again (having made up much of the time we'd lost on departure, as it often the case). Sadly there were no more amusing incidents with customs - I think they'd all gone home to bed. Eventually we located the taxi Jean had earlier ordered and all piled in to go back to Jean's. It must have been gone midnight by the time we got back to her place but we were all keen to get back to our beds so I decided to drive the other five of us back home rather than stay the night at Jean's again. The weather back home was dreadful - it was cold and raining. I was glad I'd had to foresight to wear trousers and put a jumper into my hand luggage. I dropped of Karen, Keith, Andrew and Jamie and was soon back in my own home. Rest at last! Now where should I go next..?